Denise Peck is the editor of Step by Step Wire Jewelry magazine, and she has written 101 Wire Earrings, Step-by-Step Projects and Techniques. The first part of the books covers the basics of wire, the tools, and all the techniques you’ll need to make all of the projects in the book. This section is excellent, with clear photos and well-written instructions. The main part of the book is devoted to the projects. Each of the 101 earring designs has a photo, a list of all tools and materials you’ll need, plus step by step instructions. There are no process photos, which might make it a bit of a challenge for beginners, but most of the earrings are simple enough to figure out from the main photo. This is not a book for really experienced wireworkers. There is not enough of a challenge for you unless you need to brush up on your basic skills. However, the variety of earrings included pretty much assures that everyone will find something they like! As we often say here, no book can be all things to all people. The projects are mostly inexpensive and require minimal tools, and that can be a real plus. Free Stuff Alert***Free Stuff Alert!! 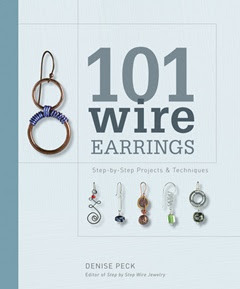 I’ve got a copy of 101 Wire Earrings to give away over on Jewelry & Beading! Just leave me a comment over there and you’ll be automatically entered into the drawing. In a week, I’ll randomly pick a lucky winner.